Yesterday, Mom and Jamie met some New People. They went over by the New People’s house. Mom came back sad. She said that I was brought up during their conversation. She said that the husband shook his head and said, quote, “I would never love or trust a Pit.” Many people feel the same. Mom stroked my back and told me she said to him that I was loving, loyal, and a good girl. Sure, I have my issues. Who doesn’t? In all my life, I’ve only done what they asked me to do. The humans who abused me before. The humans who took care of me at the Shelter. And the humans I have now. Yet, I am feared, I am discriminated against. Who made me this way? The long-time-ago humans took me from my mother when I was just a puppy. When I was very young, they made me have puppies, then they took them, too, and kicked me out. Into the snow. You know what Chicago winters are like. Not even people from Alaska want to come here in December and January. But there I was, on the street, with my naked pink paws and thin, thin coat. I’m a people person. And I dream of the day when me and my kind have an equal chance like other dogs. 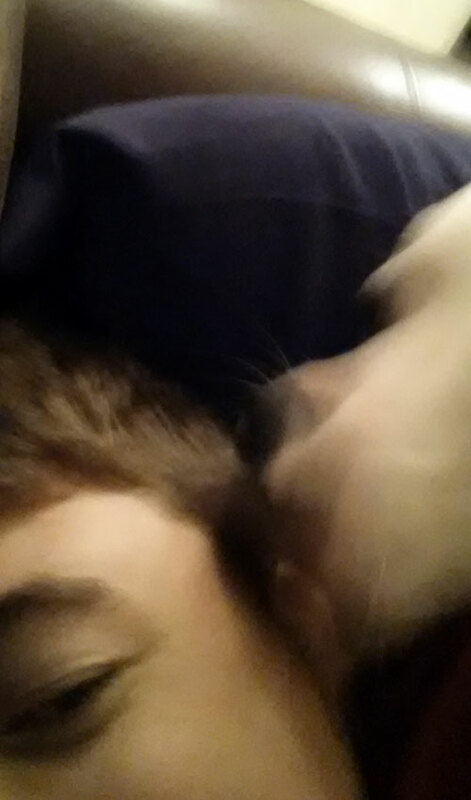 This entry was posted in Uncategorized and tagged discrimination, dogs, love, Pitbulls on June 26, 2015 by maggie0019. Sorry, I don’t have any cute pictures today! It’s been quite busy here. Mom got up early (as usual) on a school morning and when Dad and Jamie left, she got right to work. She put on her old painting clothes and taped out the hallway. Then she sanded down where she had put plaster on the holes. Some of which I admit I made. Mostly I am responsible for the plaster coming off the corners from me whacking the walls when I am playing. So she re-plastered those, too, and bought these “corner guards” for after the paint job is done. Mom bent over to sand the corner and I sniffed her. She straightened up quickly and said, “MAGGIIEEE!!! !” I can always tell I’m helping when she says my name like that (*looks satisfied*). For a while, I sat on my chair, and watched Mom heave herself up and down the ladder. Up and down. Up and down. 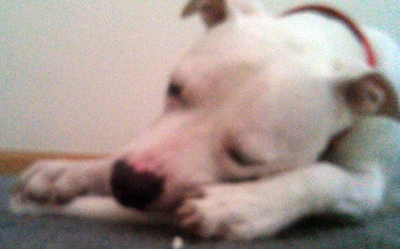 Finally, I had had enough and took my soft toy bone and threw it at her. Between sanding, taping, and painting, Mom did a decent enough job of tossing the toy back and forth to me, while keeping up a running dialogue. “Painting with Pitbulls” could be a new show on HGTV! I do want to mention that, while I was madly dashing through the living room and kitchen, I did not go into the hallway near the paint pots or ladder. I think I deserve props for that! Finally, Mom said she was finished for the day and cleaned up. She took me outside and gave me a treat and told me I had been a good girl. Then she stripped off her paint clothes and collapsed on the bed. “Oooh, my back!” Mom groaned. Naturally, I leaped into bed to keep her company, but noticed some cats outside that I had to stand guard over. So, I settled for sticking my behind against Mom’s knees and perking up my ears while looking out of the bedroom window, to better survey my Kingdom. Mom took a 20 minute power nap (she says) and then she took a hot shower. By this time, the cats had escaped under the pine trees next door, so Mom covered me up in a blanket and let me nap, too. Mom’s going to let the paint dry, then do touch-ups on everything Friday. Hope you all had a busy, productive day, too! This entry was posted in Uncategorized and tagged dogs, hallway, naptime, painting, Pitbulls on March 18, 2015 by maggie0019. Hi, Elizabeth here. I saw something on FB that really boiled my blood and I want to share my indignation with you. There was an ad for a hoodie with, “And on the 8th day, God said he needed a loyal companion and he made the Pitbull Terrier” for sale on FB. Now, Maggie is not a Pitbull Terrier. She is an American Staffordshire Terrier, but I digress. 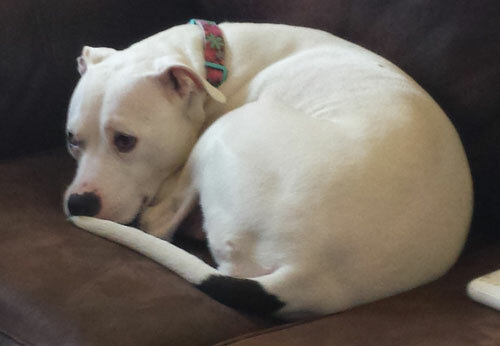 She is referred to as a Pitbull. Underneath the picture of said hoodie, some lady writes: “Don’t blame God for them”. Don’t blame God for them. Why would anyone feel such hatred toward an animal? 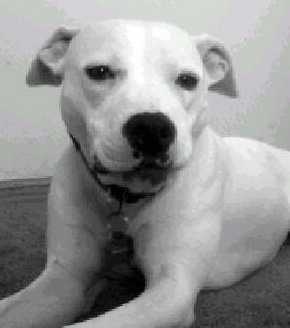 I realize, yes I do realize, Pitbulls and Pitbull-type dogs get a lot of press, most of it negative. I realize that, while these dogs were initially bred to capture rats, weasels, skunks, and other pests for their owners, that they have been used and abused to fight, often to the death (or death comes later, in the form of horrific abuse after losing a fight). But to say, “Don’t blame God” for the creation of these dogs? What was that person thinking? It is humans who pervert these creatures to satisfy their greed and blood lust. Tragically, these dogs are unswervingly loyal and loving. If “Master” says fight, then fight it will be. Honestly, look at a litter of Pitbull pups and tell me they are monsters. Yes, they can be turned into monsters, but so can any breed if not handled properly. Given the opportunity, these dogs want loving and will love you back in a way that’s hard to understand unless you’re on the receiving end of their unswerving devotion. That’s true of a lot of dogs, too. It just ticks me off when people believe all the bad hype and don’t consider all the Pitbull therapy dogs, police dogs, military dogs, or just family pets. I’ve never, ever thought that I would be a Pitbull mommy. Greyhounds were my thing and I actually had my eye on a German Shepherd the day we went to the Animal Welfare League. Jamie fell in love with Maggie and our lives have never been the same. Oh, she’s not as much of a couch potato as the Greyhounds were, but you’ve seen pictures of her on her chair and you know she likes her downtime. Yes, she is intelligent, needs intellectual stimulation and exercise to be relaxed and happy. News flash! So do most of the larger breeds or they get restless and aggressive. Why? Because they were bred to be working dogs and they need a job to do. Mind you, Maggie was abused in her past life. If I raise my voice, she cowers to the ground and shows me her belly. I can only imagine what she’s been through. Yet, she gave humans a second chance. She “mothers” Jamie and comforts me. It’s more than we deserve. You can be sure I informed that woman on FB that Pitbulls were misunderstood creatures and fine animals. No, I don’t blame God for my Pitbull. I thank God for her! This entry was posted in Uncategorized and tagged dogs, FB, hatred, ignorance, love, Pitbulls, rant on February 5, 2015 by maggie0019. Mom’s been feeling better today, and treating me like a Queen lately! I’m not taking any chances, though, and have stayed glued to her hip. Oooh I look all white and glowy. Then, Mom felt well enough to coax me into the walk-in shower for a bath. By the time I was done shaking off (Mom first ambushed me with a big towel), she was as soaked as I was! Mom always laughs at my crazy behavior when she takes off my collar. I always start streaking around like the Hairy Bullet. And of course, I am streaking – I’m naaaaaaked! Woo-woo-woo! Mom says that I act like a Wild Thing without a collar. She tells me, “You must know that collar means you belong to someone, Maggie, ’cause you sure act differently without it!” She says that every time. I can practically predict it! Mom won’t let me out of the house without my collar, even though I am micro-chipped. She says it’s too dangerous for me, being classified as a Pitbull. Mom knows I don’t like the blow-dryer, so she lets me play and run around with my toys until I get dried off. Then she puts the collar on and Boom! I start behaving again. I guess it’s because I know they are still keeping me. It’s a sense of security for me. 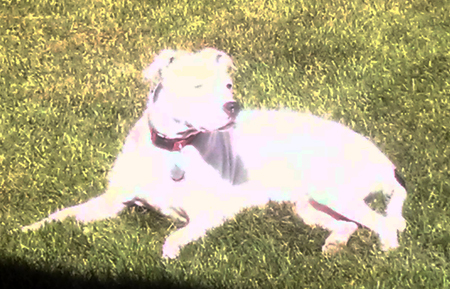 This entry was posted in Uncategorized and tagged bath, collar, dogs, Pitbulls, play, sunbathe on September 26, 2014 by maggie0019. This entry was posted in Uncategorized and tagged Pitbulls on April 8, 2014 by maggie0019. My family surprised me with some fun new chew toys, and I haven’t even completely destroyed them yet! This replaces the smaller indestructible Nylabones that I managed to chew the corners off. But I was really excited and happy when I was presented with a squirrel toy. 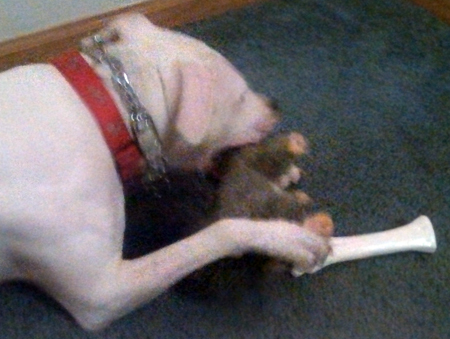 I love furry toys, but since I am such an avid chewer, they usually don’t last very long around me. 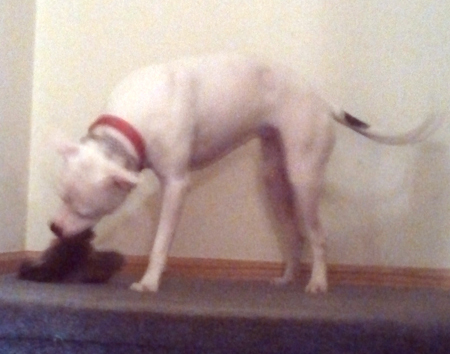 When I got the squirrel, I ran to my special spot at the top of the stairs and started whipping it around. Oh, Pitbull Joy! I love my new toys! And they’re mine, all mine!!! Until I shred the squirrel. This entry was posted in Uncategorized and tagged dogs, new chew toys, pets, Pitbulls on March 25, 2014 by maggie0019. We celebrated Valentime’s Day. Mom got her exact replica scarf of the one I chewed a hole in last week She was very, very, happy. I glanced up at the table and saw the scarf in her hand, and gave her a knowing Pitbull smile, but she picked it up far over my head and said, “No way!” I think she is on to me. I got a Dingo rawhide bone (with meat in the middle!) and a whole can of Pedigree Chicken & Rice with some dry food mixed in. I was a fat and happy girl! It was when I was prancing around for a (further) treat that Mom noticed something wrong with my paws. I had cracked one nail badly and the other was about taken off. Mom immediately called Dr. W.’s office and scheduled me in for the next morning. Which brings us to 2/15/15, The Pet-icure. I had never had a pet-icure before. Usually, my nails are short from running around outside and taking long walks. However, with the snow piled up and 3 to 6 more inches expected tomorrow throughout the day, my time of running around outside is nil. Mom figures I broke the nails during one of my Hairy Bullet escapades, running through the house, sliding across the kitchen floor and BAM! Into a cabinet or wall. Mom put on her coat and I started my usual hide under the table skulk. I was so surprised when she called me out to Zeus with her! I was happy; I like the little car. We took the quick trip to Dr. W.’s and, as usual, I was overwhelmed and overjoyed at the variety of smells and the niceness of the humans who work there. They are always happy to see me! A nice young lady took my lead off and put a nylon halter over my head. Mom waited in the People Room, and the nice lady said, “Don’t worry, Mom’s right outside.” They put me on a big scale/table thing and one person watched my head while the other person clipped my nails. She was very careful on the 4th and 5th digits (as she called them) because that’s where the breakage was. She put a little medicine on for pain (I didn’t have any) because part of the quick is showing on one of the cracked ones, but unless I start hurting or swelling, I will be fine. I was out of there in 15 minutes, with everyone praising me and telling me I was a good girl. Mom took me home, let me out, and gave me a hug and a treat. The pet-icure was not bad at all! I hope everyone had a very Happy Valentime’s Day, and that all you humans got wet food and a Dingo treat, too! This entry was posted in Uncategorized and tagged dogs, nail trim, Pitbulls, Valentine's Day, vet visit on February 16, 2014 by maggie0019.